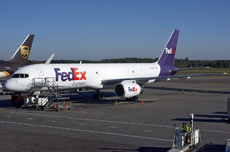 A Boeing 757-200SF, registration N919FD operated by FedEx as flight FX5065, was involved in an airprox incident with a Beechcraft C-12V Huron while on approach to Tel Aviv-Ben Gurion Airport, Israel. The Beechcraft C-12V Huron (a Super King Air for military use) was operated by the U.S. Army under flight number MFO692 to Sharm el Sheikh, Egypt. The flight crew received a departure clearance from the air traffic controller at Sde Dov: "clear to destination via KANER ONE BRAVO departure limited five thousand feet on the SID." MFO692 responded: "Roger is it cleared via the ADLOD departure?". The controller then recleared the flight for the requested departure procedure: "ADLOD ONE BRAVO departure limited five thousand feet on the SID." The flight crew read back: "All right the ADLOD ONE BRAVO departure up to five thousand feet", to which the controller added: "limited five thousand feet on the SID". This was read back by the crew as: "Roger maintain five thousand feet." MFO692 then departed from runway 21 at Sde Dov, climbing in a southerly direction. This took the flight toward the runway 12 approach path of Tel Aviv-Ben Gurion Airport. At the same time, the FedEx Boeing 757 was on final approach to runway 12. Both aircraft received TCAS Traffic Advisory (TA) warnings, followed by Resolution Advisory (RA) warnings. Both flight crews maintained visual separation and flight FX5065 aborted the approach and climbed on runway heading. They were then vectored for another approach to runway 12. A safe landing was carried out at 06:58 hours. The Beech Huron continued to its destination. Minimum separation was 0,4 miles (740 m) horizontally and a little over 300 feet (90 m) vertically. The investigation by AIAI Israel revealed that the flight crew of MFO692 misinterpreted the clearance, not knowing they were supposed to maintain separation from ILS runway 12 path of Ben Gurion Airport. Contributing was the lack of a proper pre-flight briefing on the specific airspace arrangements between Sde Dov and Ben Gurion Airport. Additionally, AIAI Israel blamed media for misinterpreting flight track information from Flightradar24. Media mistook a controlled manoeuvre during initial approach for an evasive manoeuvre to avoid the Beech Huron. The occurrence was initially classified as a Serious Incident, however, it was later reclassified as an Incident because the actual risk of a collision between the aircraft in this event was very low. Mainly because the crews acted on the TCAS and maintained visual contact with each other during the event.